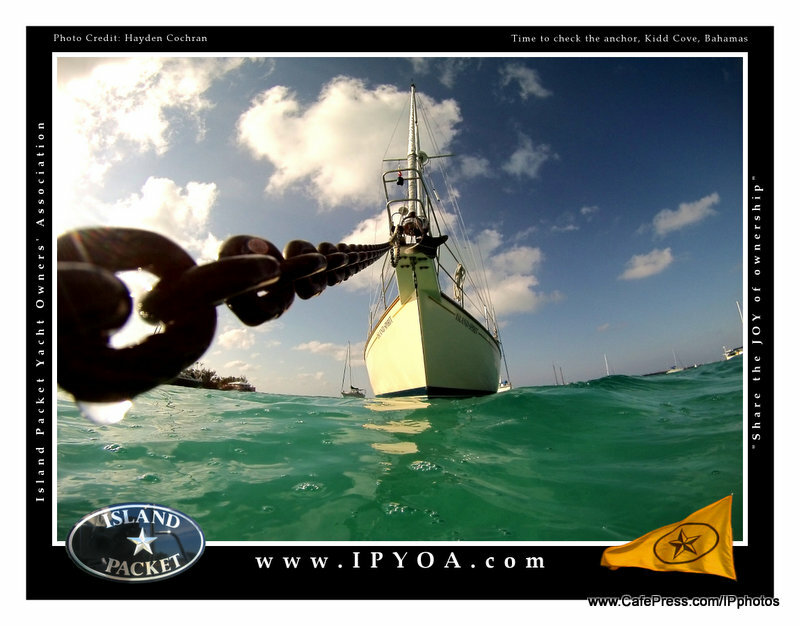 Team Island Spirit 100,000 Pageview Contest opens today. Who can capture the 100,000th page view? How will this work? You need to take a PRINT SCREEN of our blog web page on the day the page view count is exactly at 100,000. This could happen in the next 3-5 days! Email this print screen to IslandSpirit35 at gmail dot com. 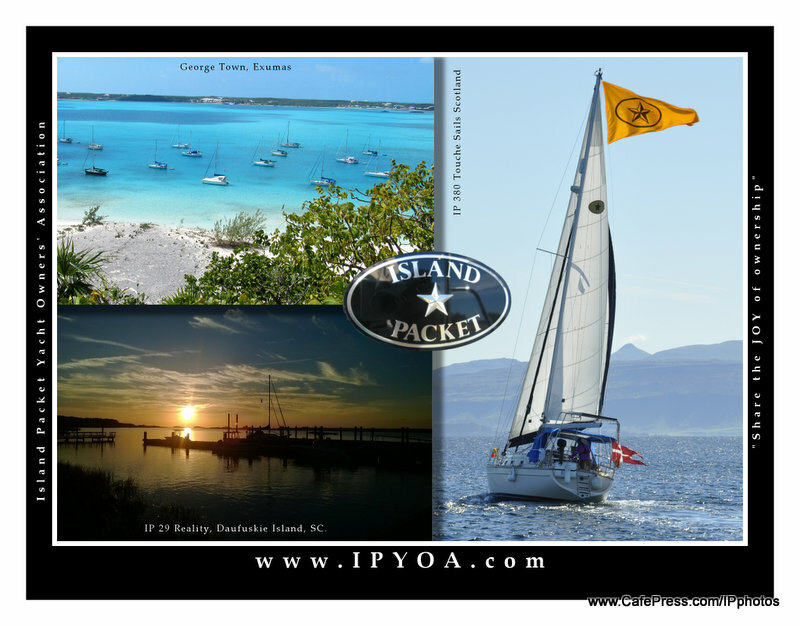 The FIRST person to do this will be given a FREE 2014 Island Packet Sailing Calendar or an IPYOA t-shirt, your choice! 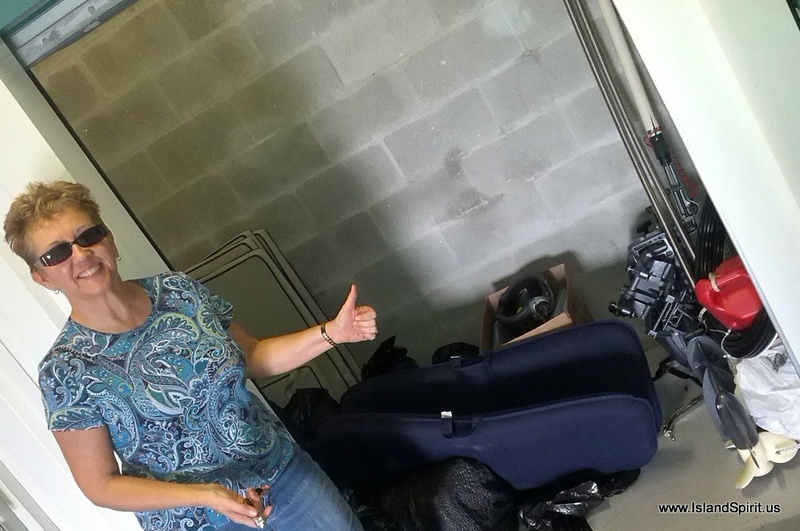 Boxes of tools, gear, and safety items…. 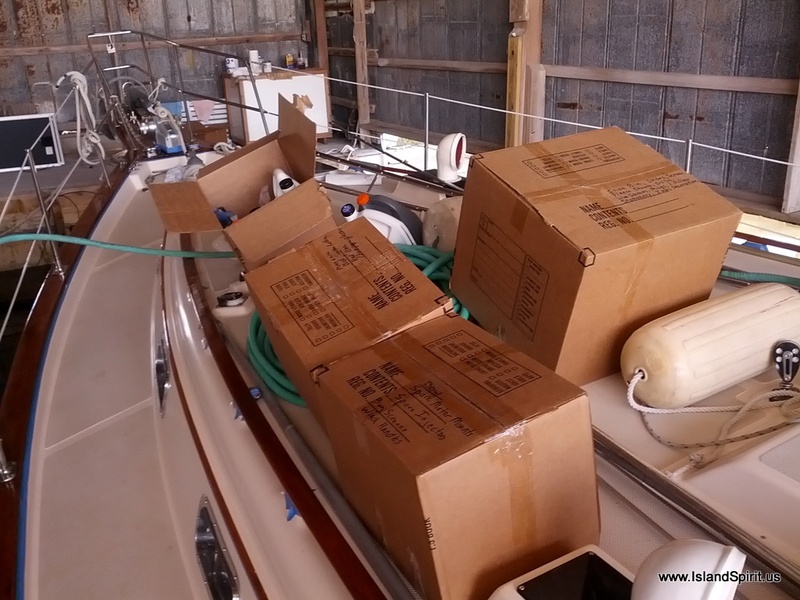 This week has been the reloading week where we have been moving car loads of boxes and gear out of out 5′ W x 4′ D x 8′ H storage rental and back onto the boat. 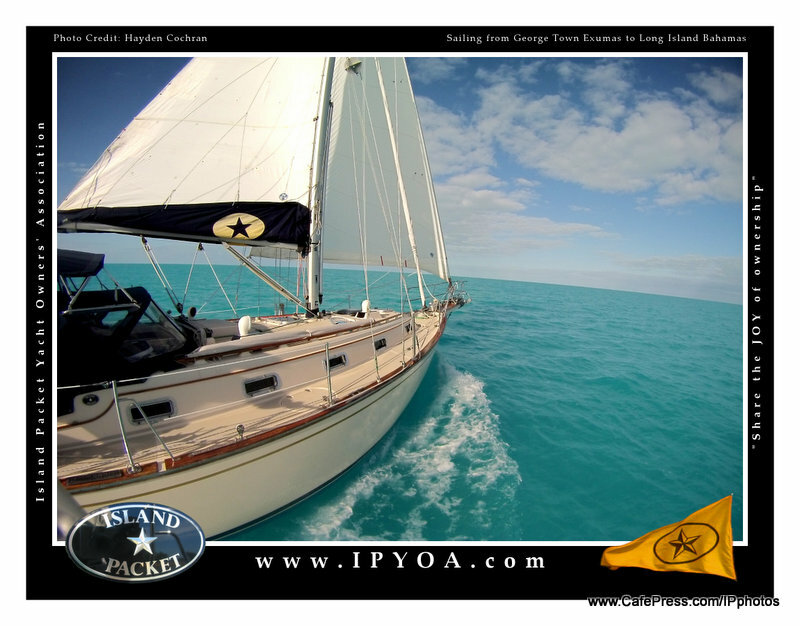 It is a amazing how much storage there is on these Island Packet Yachts. We have a locker of tools, one for spare parts, one for safety, one for wine, another for gallons of oil, and another for hurricane dock lines! These all go into spaces that are not mainly used. Then we have tons more space for food and paper products. All of this was removed and boxed and stored for shipping the boat to and from the Island Packet Yachts factory for our refit. Radeen is a Pisces,and love to SWIM….yes, we can go to the pool again! 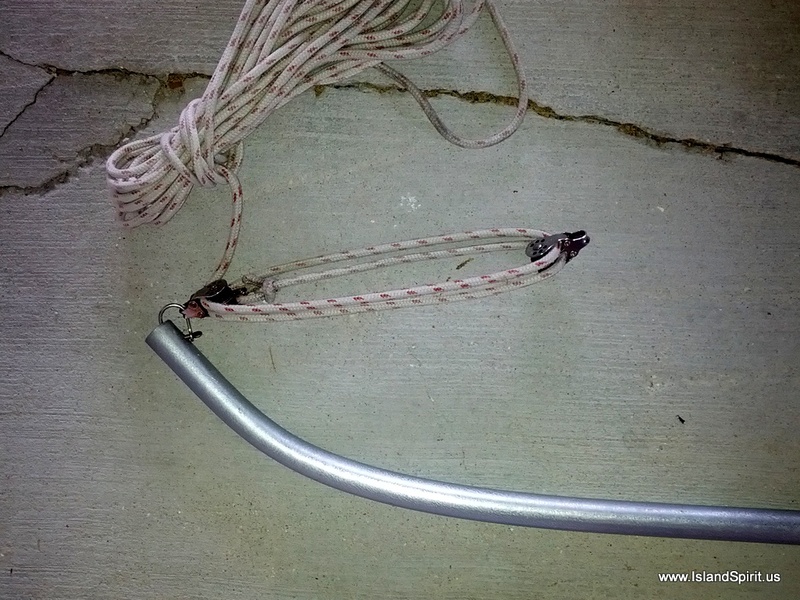 Make your own outboard motor hoist at Home Depot with a conduit bender. Thank you! So….we have been busy! It isa ton of work, but it has somehow been fun at the same time. Sure it is frustrating not having my shop or knowing the local area. Yes, I question rebuilding systems that were just fine like my solar array, but it still was worth it. 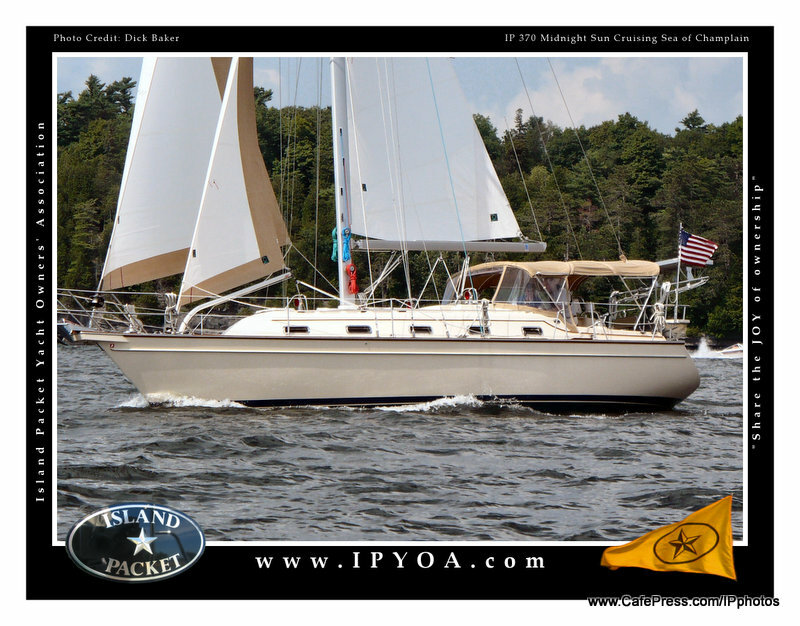 We did under estimate the time and work of tear down and rebuild, but now Island Spirit is like a BRAND NEW boat, and that is really wonderful. 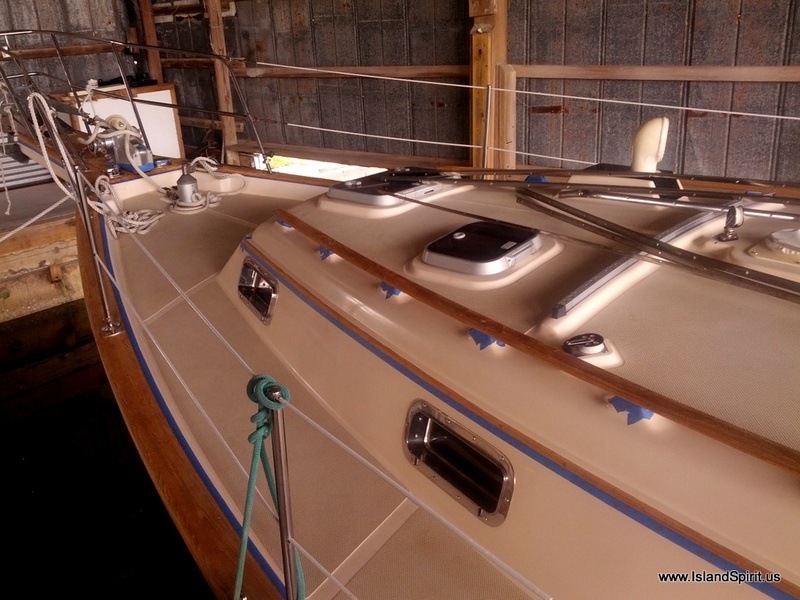 More reloading and soon the MAST will go in…. 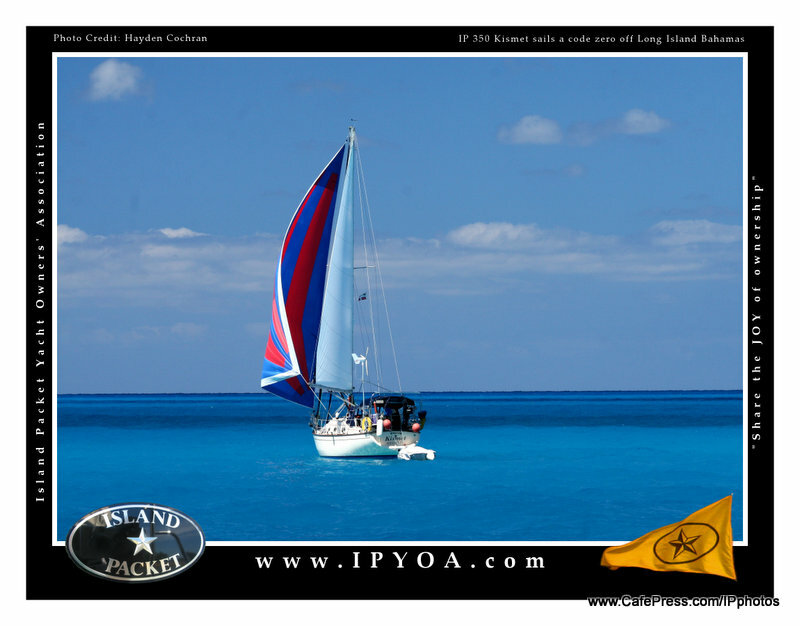 The 2014 IPYOA Calendar is released…. Here are the 13 images in the 2014 calendar. I hope you enjoy the photos. The digital file folder that houses the 2014 edition includes 93 files in 22 folders and over 535 MB of data. It took approximately 20 hours to create, proof and edit this calendar. 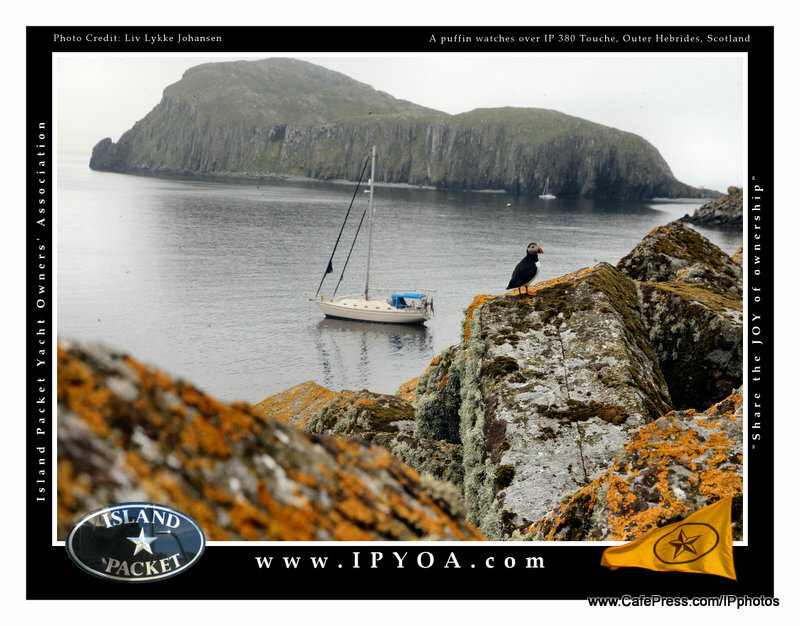 The proceeds of $5.00 per calendar are used to pay for the web servers, SQL database server, domain names, software, apps, and licenses to serve and manage the two Island Packet web sites I created: www.IPphotos.com and www.IPYOA.com. The IP factory does not pay for any of these services. The fees are paid by me and by donations from IP owners and by the sale of these calendars. Thank you! We are docked in a BARN…. Our routine: We get up at at day break (living in a condo) and after breakfast, we make lunches and pack them into a cooler and load up the car. We drive 45 minutes from Siesta Key Beach to Snead Island Boat Works in Palmetto Florida where our boat is safely docked inside a barn and in the water! This is a dream situation for working on teak as there is no dew, no sun and yet a nice breeze blows through the building. It takes about 1 hour to sand the previous coast of varnish with both of us sanding. Then it takes 30 minutes to dust off the sanding dust. In another 30 minutes, we can wipe down all the varnish with a rag and denatured alcohol. At this point, we are ready to start the next coat of Epifanes. I pour the varnish into a measured cup and add the right proportions, 15% of brushing liquid / thinner, and start the next coast. Four to five hours later I have the next coast of varnish on all the surfaces. I start at the bow pulpit and work back to the stern on the starboard side. Then I work around the stern to the port stern and work my way back up to the bow. By now, my back is about broken! After that, I launch the dinghy and, while standing in it, I can varnish the outside edge of teak and also get under this edge. 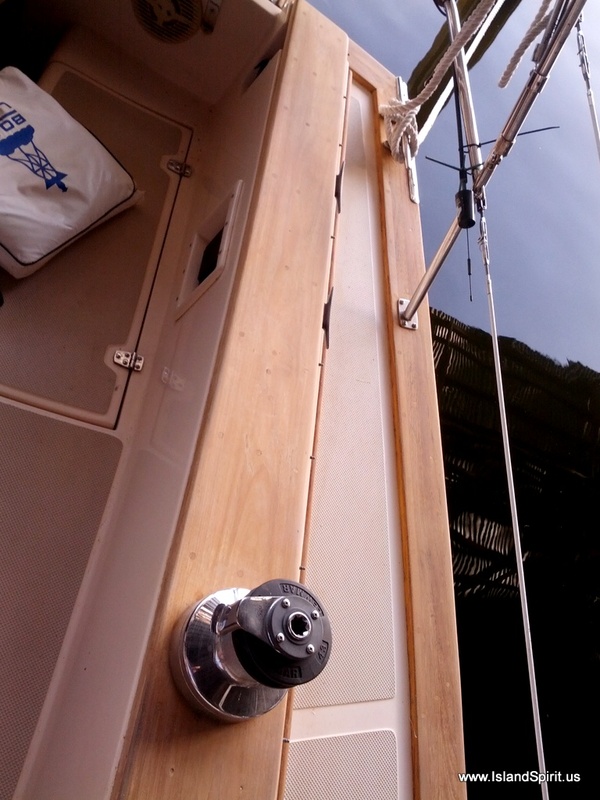 The last part to varnish is the companionway doors and door trim and then it is clean up time. Brushes are cleaned with mineral spirits and then stored in diesel fuel cups. All paints and supplies are stored. The dinghy is lifted back up into the davits and we offload to the car. By now, it is near 4 pm. 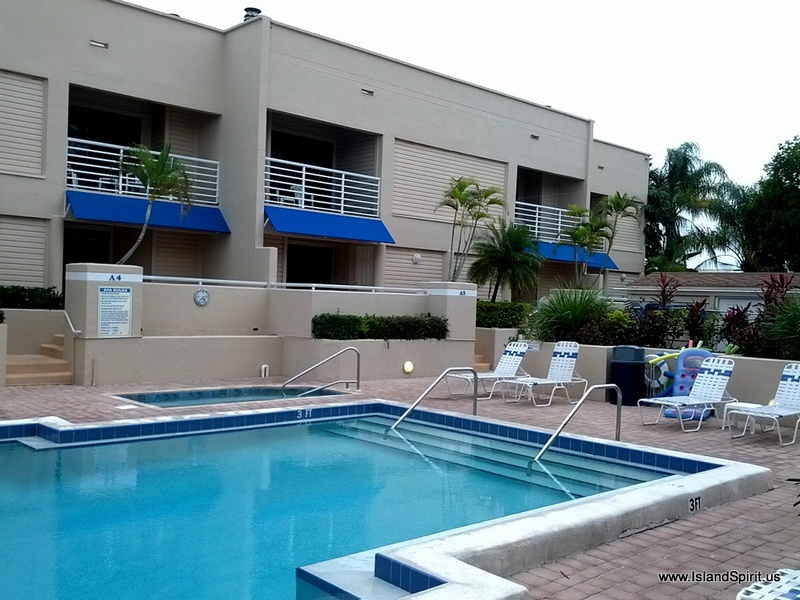 We drive home in time to hit the pool for some swimming and maybe a sunset walk on the beach before making dinner in the condo kitchen. This has been our schedule for the past week and a half. We hope to be finished with this varnish work this week, and then we can begin to reload and rebuild the boat. We had several pleasant changes to our routine today due to wonderful cruising friends. We are very grateful to all of them! 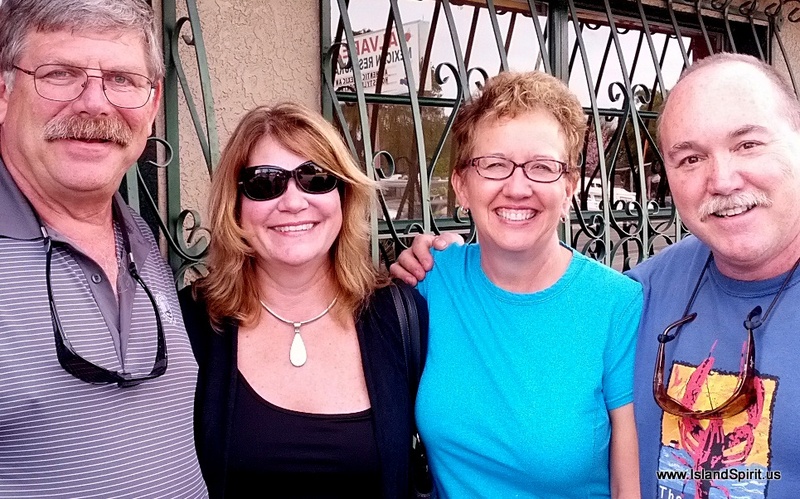 First, was a surprise visit from Loretta and Jim of IP380 Plan C. Thank you for stopping by! Next, we took our life raft to a Zodiac service center in Tampa. Thanks to a very good friend, Greg, who is loaning us his raft until he buys his next sailboat, we now have a 4 person coastal life raft. See photos below.Thank you, GREG! 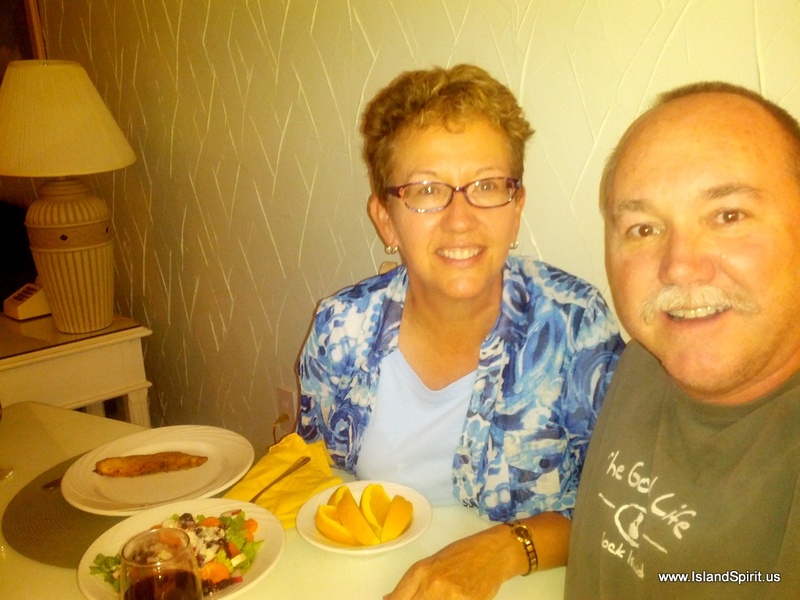 Our day ended with a lively dinner in St. Pete Beach with Larry and Phyllis, former owners of IP40 LARK. Thank you for fitting us into your busy schedule! WOW, that is coat #3 and it looks so good, amazing finish. All the stainless steel rub rails are off, so finishing the outside is easier. We hope and pray that we will NEVER need this, but it is here if we do. This is a 4 person coastal Zodiac Life Raft, 2006 model. So, another great day “yachting” and “living da cruising life” as sailor bums. Radeen and I do enjoy sharing in the work and helping each other. It is not all about sailing, it is about teamwork and being together, focused on a unified goal. That is what makes this life so much fun. Thanks for following…. 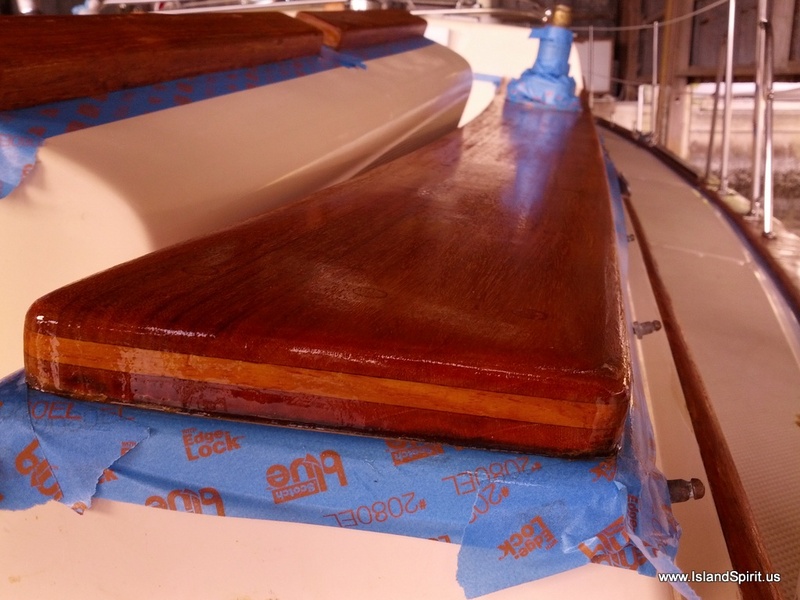 Epifanes yacht varnish is the best…. It has nearly been a week since we arrived here in Florida. 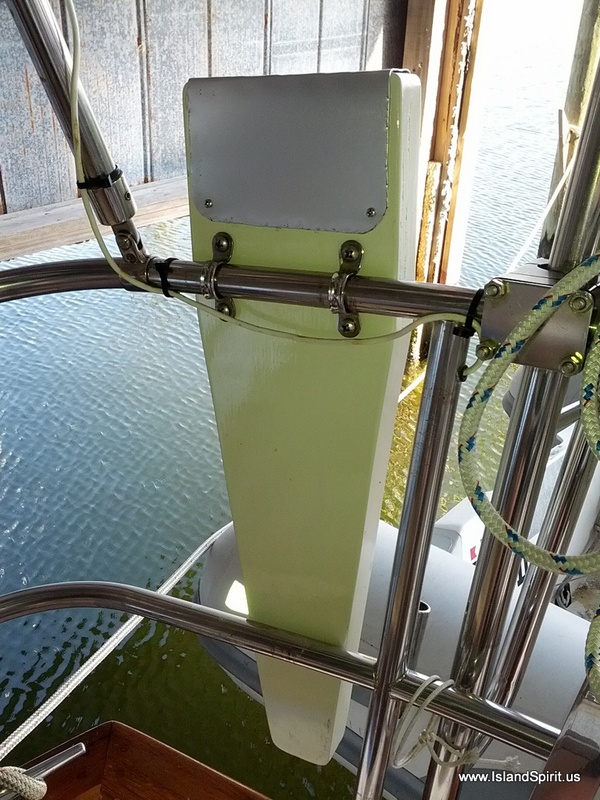 On Monday, the boat was launched. With her under a roof and in a boat shed, since she has no mast, we are working on sanding and preparing for a new yacht varnish finish. 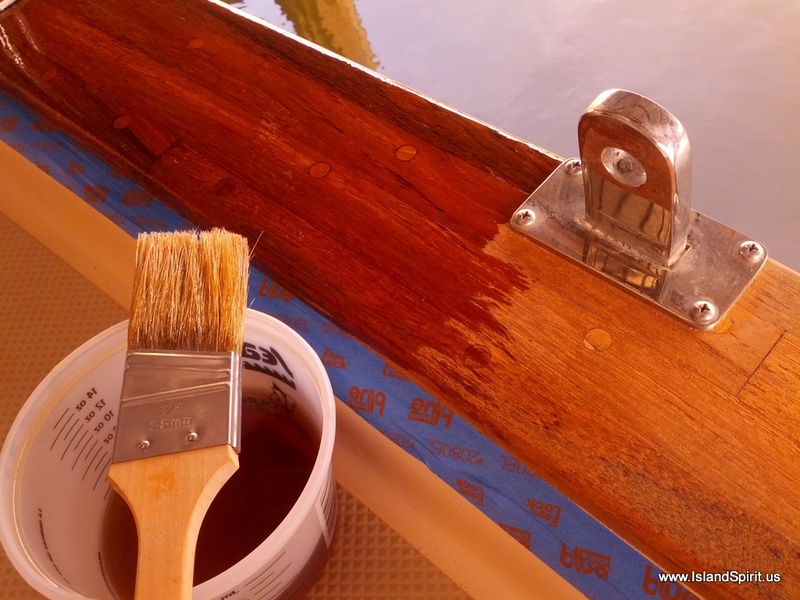 We have been doing our own varnish for the past 8 years, but we have never varnished the entire boat at one time. Usually we have the work divided into quadrants plus extras, making it much easier to handle. I know doing 1/4 of the boat usually takes 1.5 hours, so it should be no surprise that doing the entire boat takes 5+ hours. 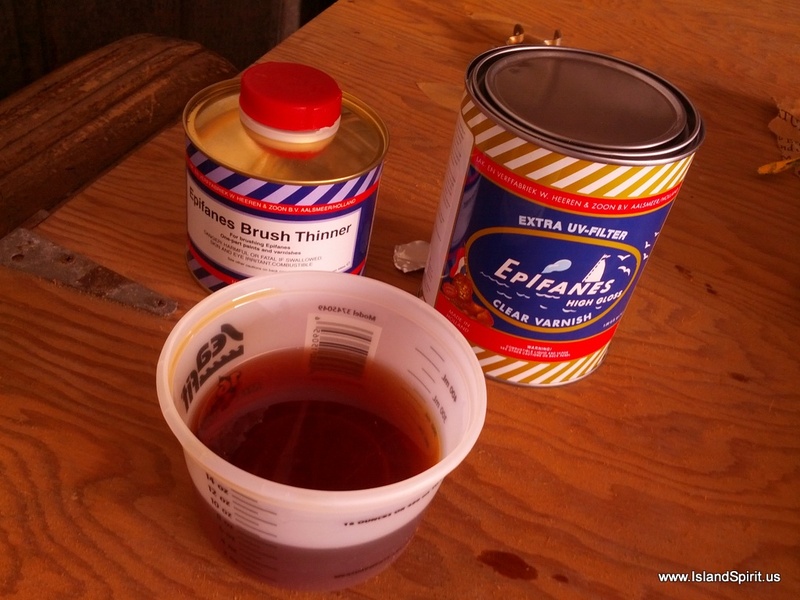 I am talking about applying just ONE COAT of varnish. 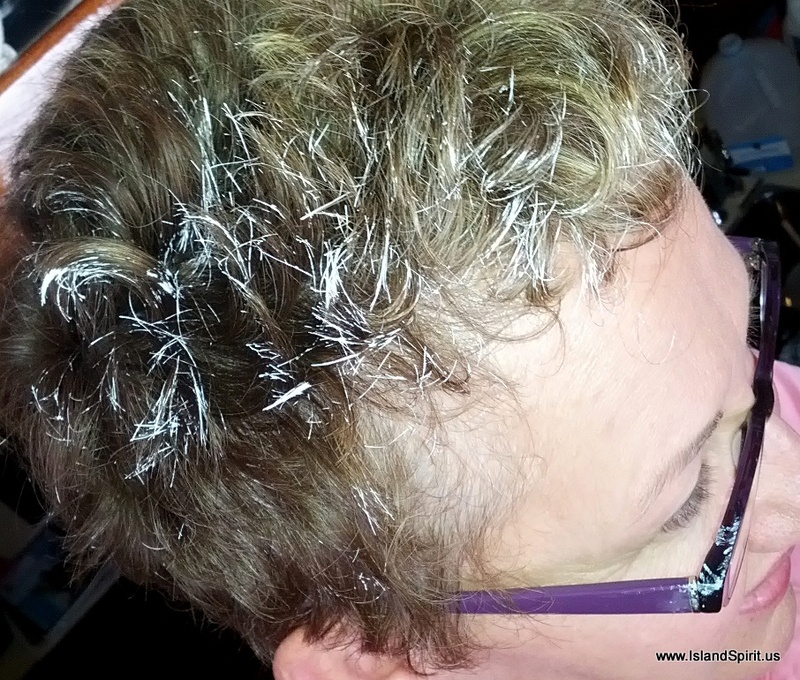 I will be working towards applying 3 primer coats and 3-4 top coats, making 6-7 coats. So, this will take a while! Carbide scraper takes off the old finish like a hand plane. 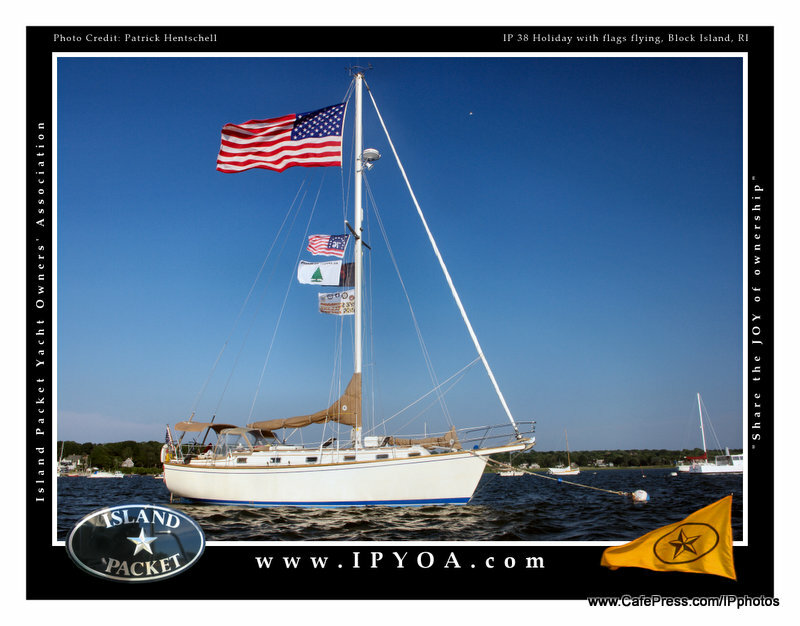 Welcome to Island Packet Yacht ownership! Yes, you can just as well let the teak all go grey and fade out or you can use other finishes that require fewer coats. We have found that once varnish is on, then taking care of the top coat is NO MORE work than any other top coat finish. So, if that is true, then why NOT use varnish? Plus, when it is on, it does look really great!. We know this is not as exciting as beautiful photos of BLUE OCEAN waters or the gorgeous white sand beaches of the Bahamas, but we will get to that this winter. For right now, we are excited about refitting out this 20 year old yacht and making her brand new again. She is like a classic car, well designed and beautiful to own. 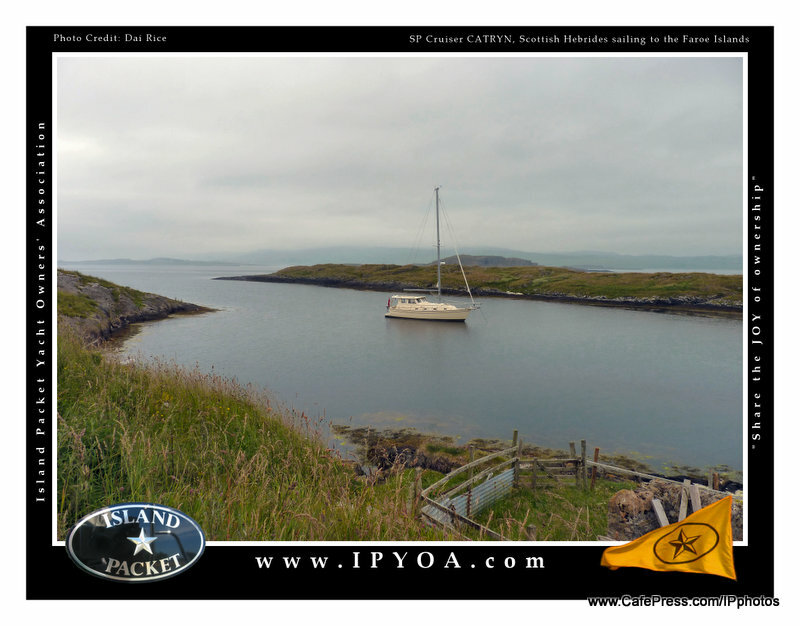 We do enjoy this boat and all that goes along with ownership. Teak work is part of the job. Lucky for us, we have been able to trade our timeshare for two condos to live in while we are working on the boat. The boat is still empty from being trucked to the Island Packet Yacht Factory for refit. 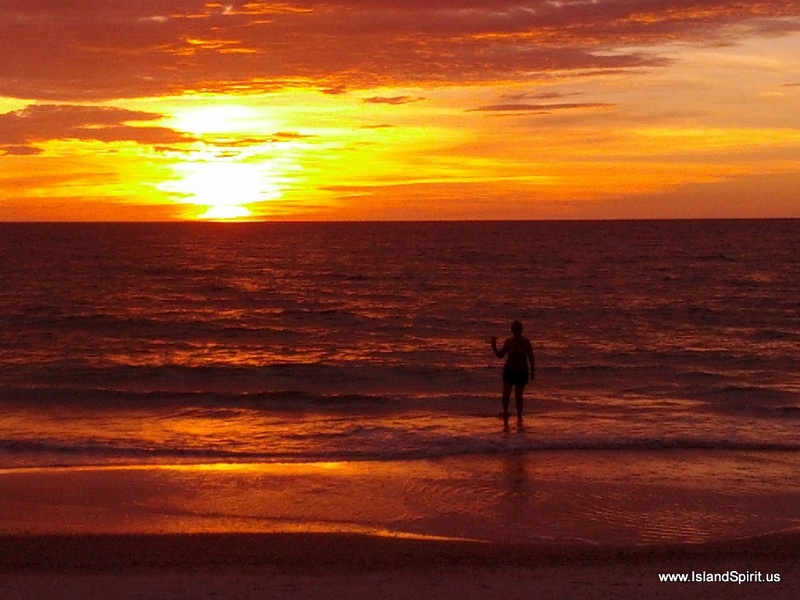 So, we work hard all day, and then come “home” and hit the pool and enjoy the sunsets on the beach and relax in comfort! Here are some photos of the work this week…. Cleaned, sanded and vacuumed teak. Radeen is a Pisces, so she loves the water. Bare teak. Eyebrow, Hand rail, gunwale. Teak every where! Next, all the edges needed to be taped with long lasting tape for clean removal in 2 weeks. There is Radeen on the bow as seen from the stern, lots of teak! Pre-dinner swim and beach sunset required daily. 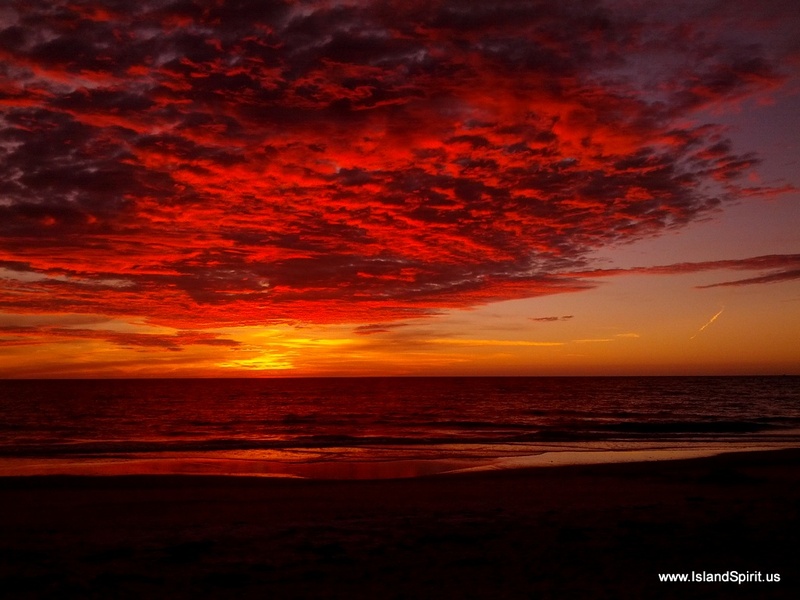 After sunset, the sky is even more beautiful. First coast of varnish is easy to see where you are. 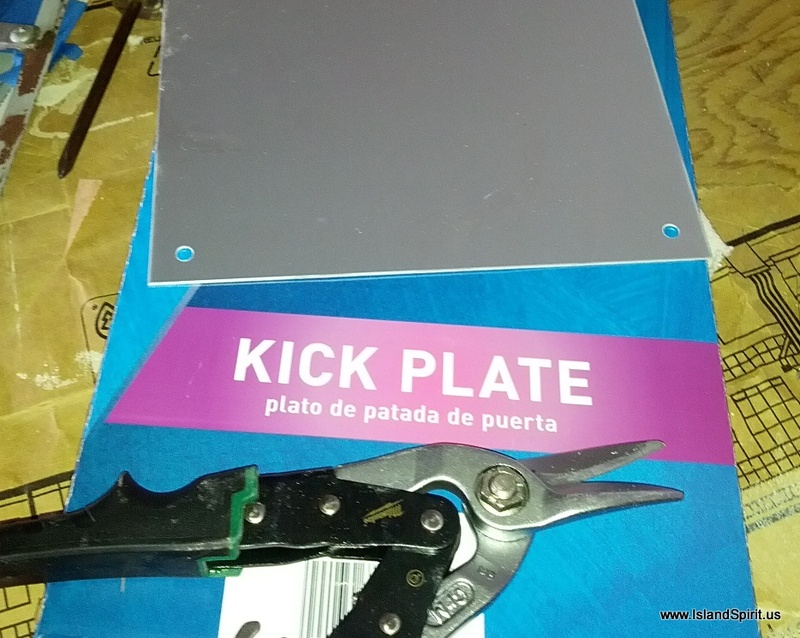 Check out the massive new chain plate! Look at this SPLINE in the end of this teak board which keeps it from warping! The cockpit is full of teak. Radeen, on the beach after a full day of teak work. It is hard to believe it is FRIDAY night, and we have been working 4 days on the teak. Monday was launch, Tuesday and Wednesday were spent sanding and vacuuming. Thursday was final prep and taping. Friday, I applied the first varnish coat. Saturday, we need to move out of condo #1 and into condo #2 and set up shop there. Thanks for following, we enjoy sharing the adventures. IP35 at Wild Acres Road, Largo Florida…..
Today was a very exciting day, as there are not many days in boat ownership where you ship your boat down the road on a specially designed yacht transport trailer. Today, we did just that!. 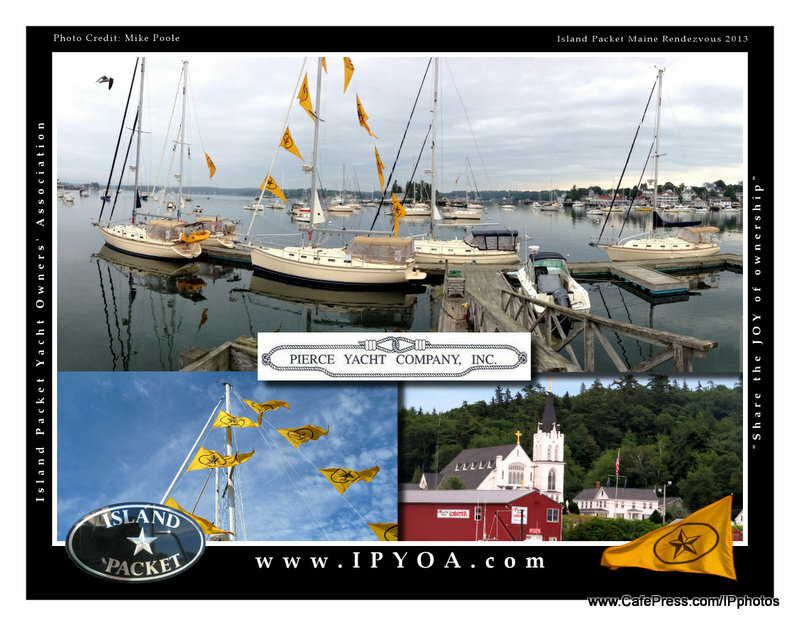 Our boat was inside the Island Packet Yachts Factory since May, where she was built 20 years ago. This time she was there for a refurbishing / refitting job! From May to November she had her systems inspected and replaced, and now she is as good as a brand new yacht. This IPY refit program has been a real JOY to be part of, as the quality of work is exactly what we all love so much about our yachts. It is PERFECTION. 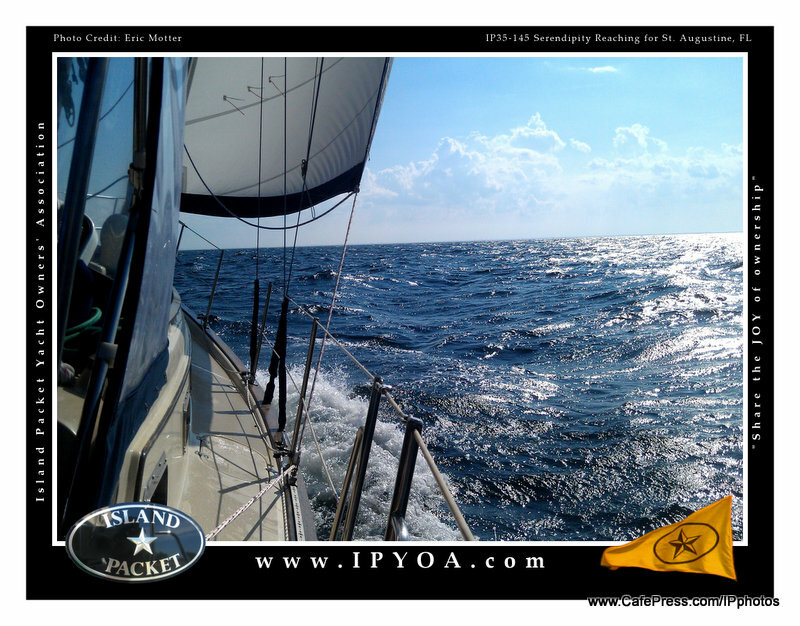 No one can build a better yacht and no one can refit an IPY like the ORIGINAL TEAM. These are the key reasons we did this. 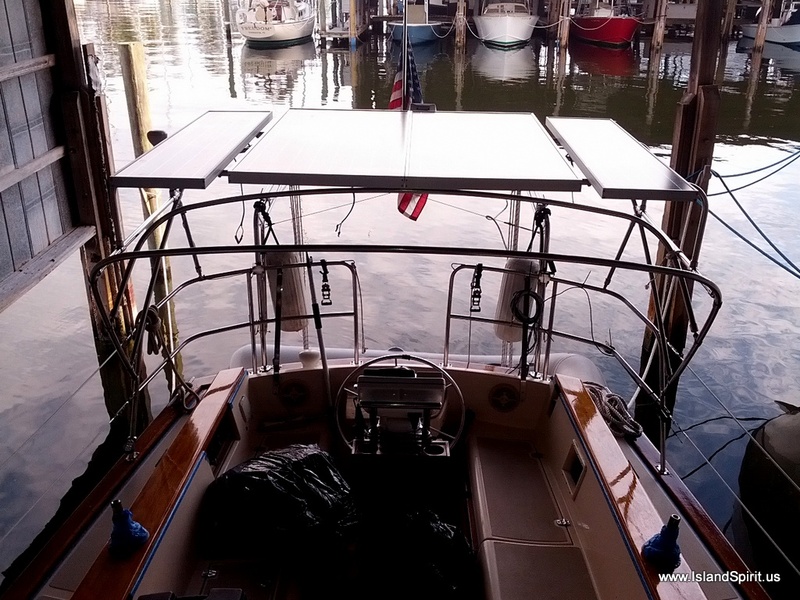 Today, with her new systems and full refit, she went on a WILD ride at 60 MPH for about 40+ miles from Largo FL to Palmetto Fl, where we launched her back into the water at Snead Island Boat Works. Look at the width, 12 feet wide….do not pass this! just like this yacht did in 1993, 20 years ago! 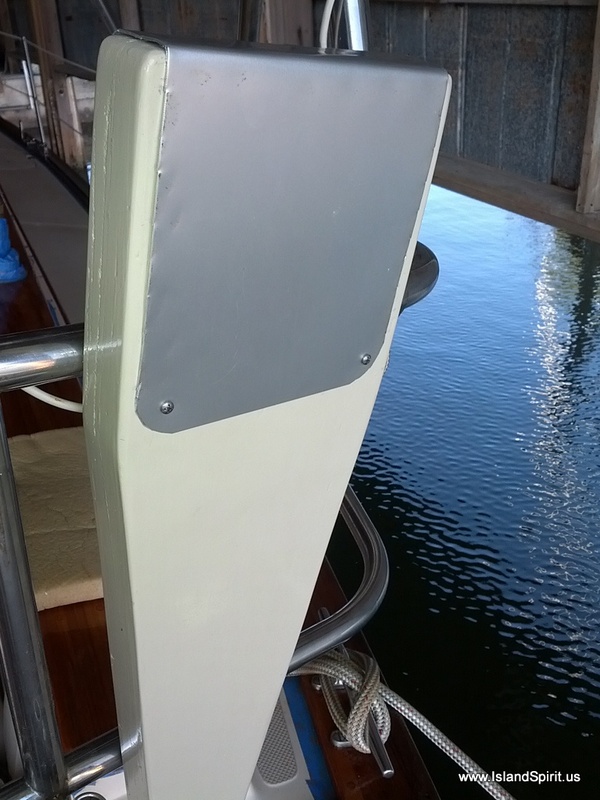 The boat measures 13′ 6″ to the highest point. Looks like it will hit the bridges. TOLL BOOTH at the Skyway Bridge, this roof on the right is an issue, but she fit. 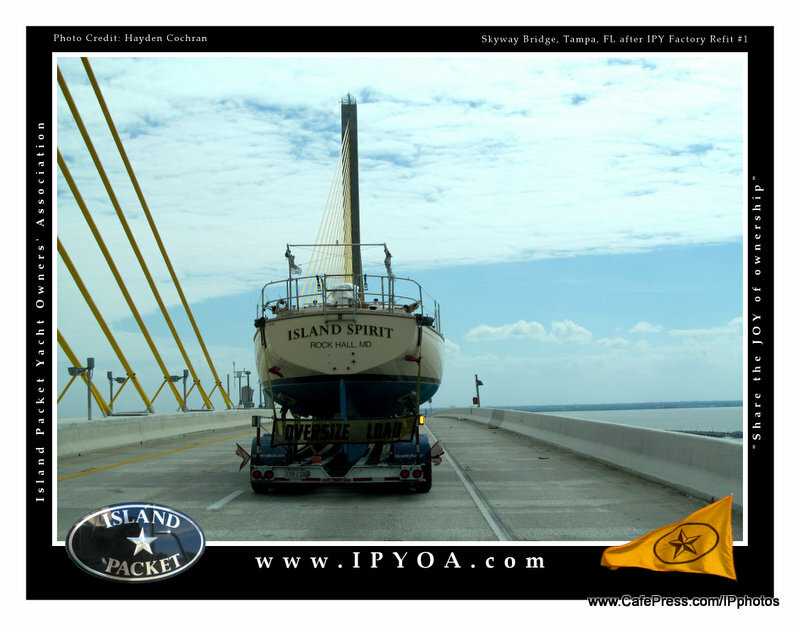 Island Spirit over TAMPA BAY, on the Skyway Bridge! SAFE….she made it. Thank you, Joules Yacht Transport. This is a SMALL yacht on their trucks. The driver said he did not even feel it back there. They can haul up to 65 feet long. This boat is 40 feet over all and 18,000 lbs. The crane / travel lift is driven over the truck and trailer. The yacht is lifted off the trailer and the lift drives around the trailer. The travel lift then drives across the parking lot to the water. The boat swings and sways back and forth, it is wild! The yacht is lowered to the water and checked for any leaks. We then drove the boat to our COVERED slip. 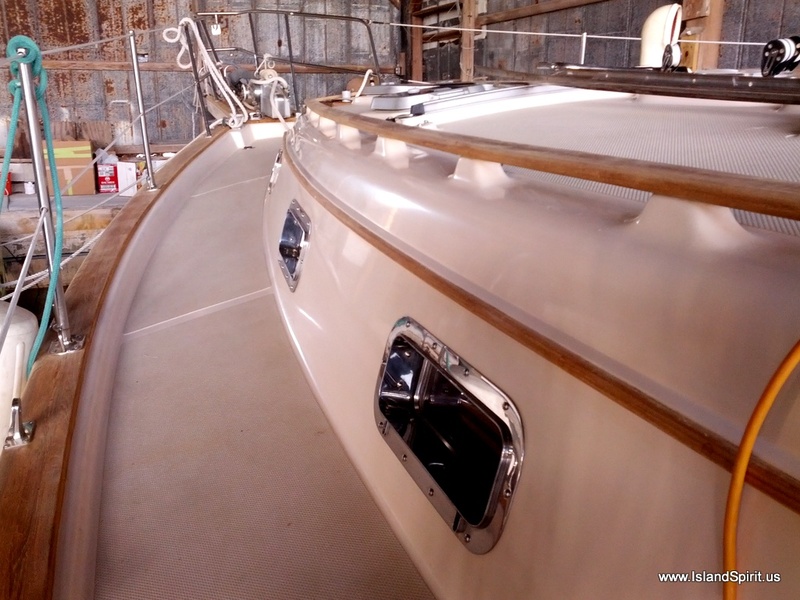 Island Spirit is under a roof, where we will work on varnish. Check out this spot. Our own BOAT GARAGE. No mast, so we can do this. Wonderful Island Packet Friends surprised us and helped with docking. Our next task, while the boat is totally empty, is to paint the interior of all the lockers. 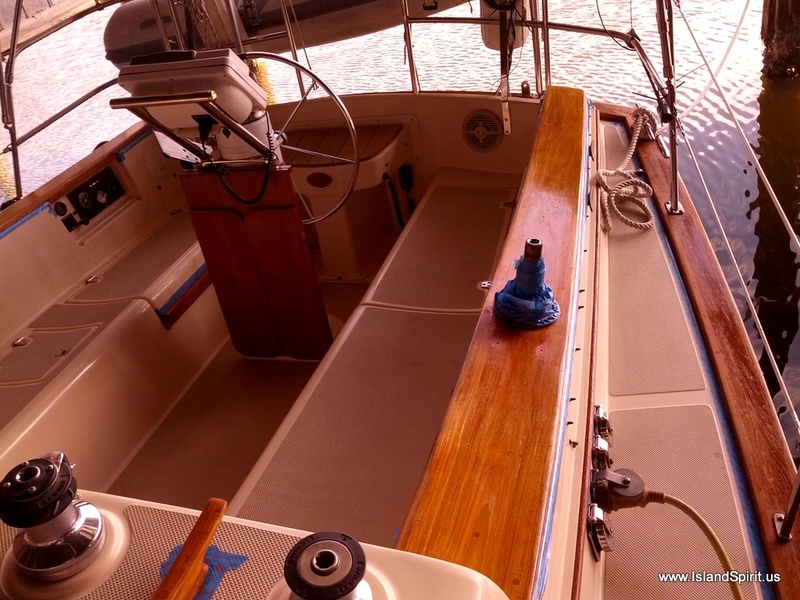 We will be applying new varnish to all the stripped teak on deck. 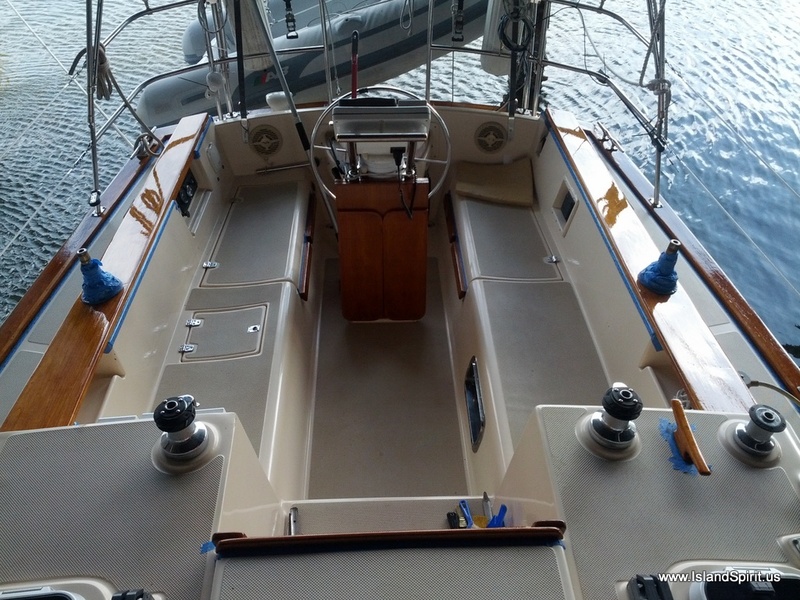 We also have some varnish to work on below deck. This could take a while. 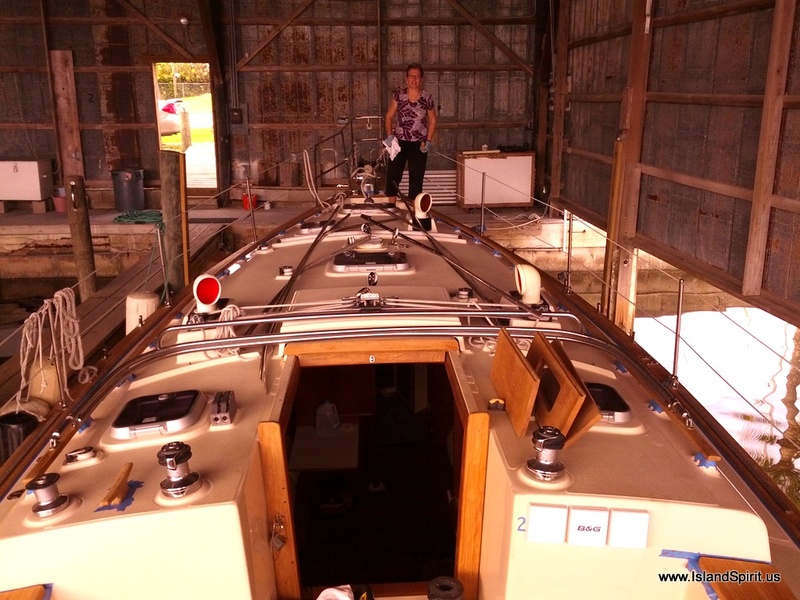 Being under the roof in a boat shed is a really cool place to work on varnish, no sun, no dew, no rain, no heat…..lucky that Snead had such a great spot for us! The 2013 run to Florida….done…. 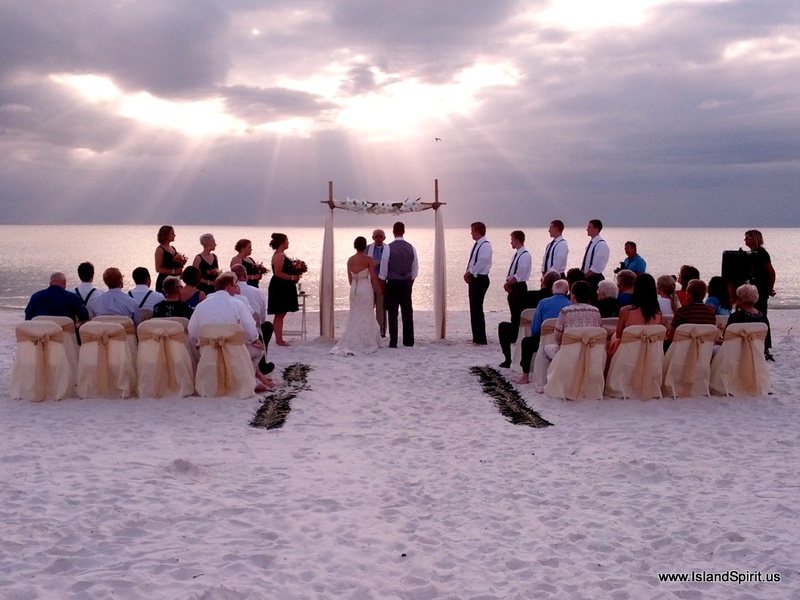 Here we are in Florida, we did it! 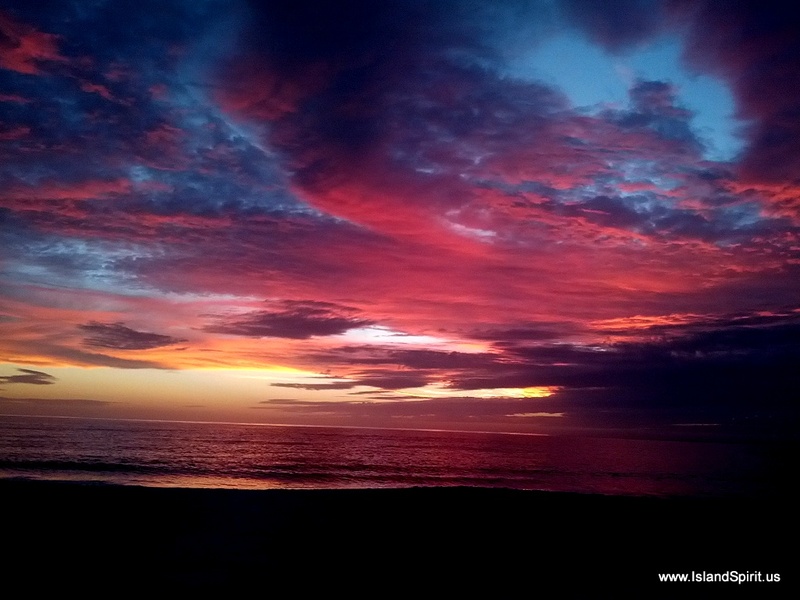 We met our goal of Nov 1 departing and Nov 2 arriving and setting up shop in a condo at Bradenton Beach, Florida. 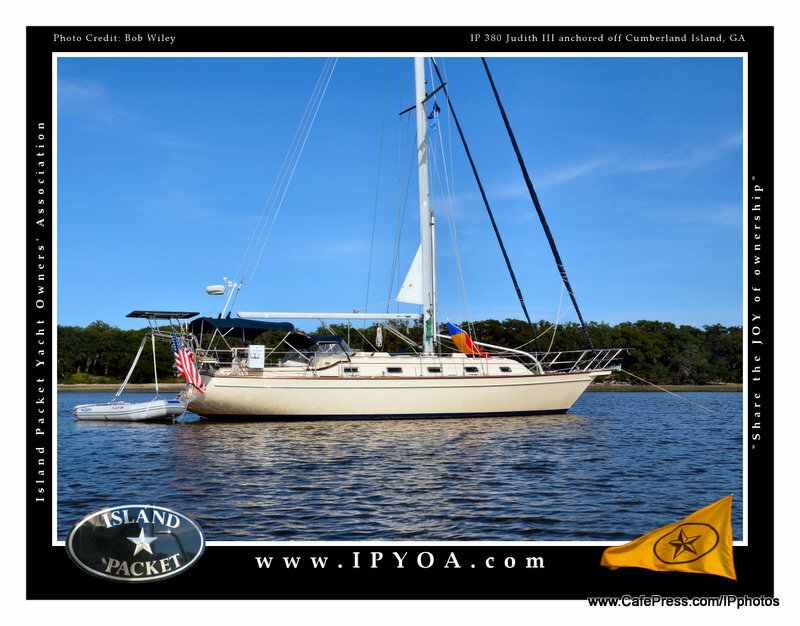 Our goal this week is to truck and launch IP35-165, Island Spirit, out of the Island Packet Yachts Factory, Largo FL, where she underwent a full refit for the past six months. 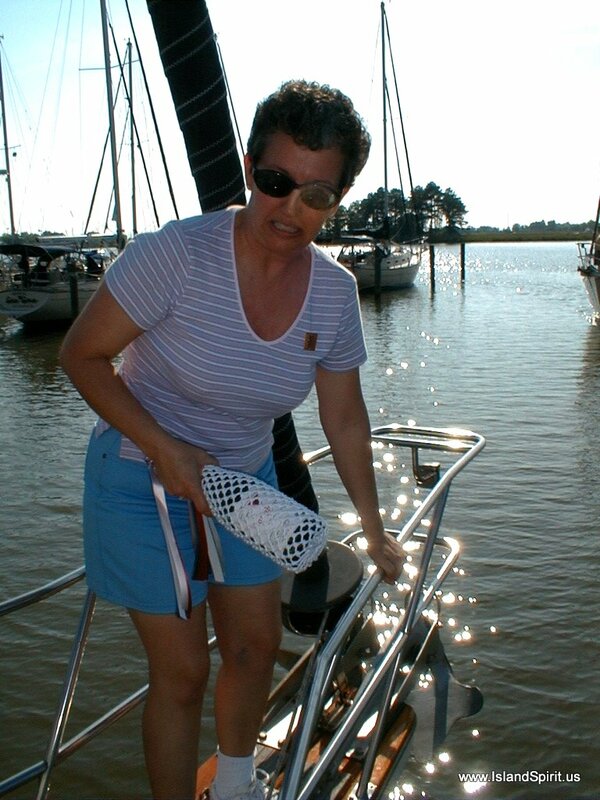 We will splash her back at Snead Island Boat Works, Palmetto, FL on Monday, Nov 4. This process will take most of the day. Once back in the water, we will begin the rebuilding of our boat. First, the trip to Florida. We drove home in May using a mini-van and we drove back using our own car, a Ford Taurus we call GOLDIE. Packed into the car was everything we removed from the boat and brought home, like a 50 lb SailRite Sewing Machine, and a Zodiac Life Raft given to us by good friend and former IP owner, Greg. These two items alone nearly filled the trunk. Added to this, we needed to pack wedding clothes for a friend’s wedding we will attend in Mexico over Thanksgiving. Then add in our computers and our clothes for cruising over the next seven months and this packing was a massive deal. 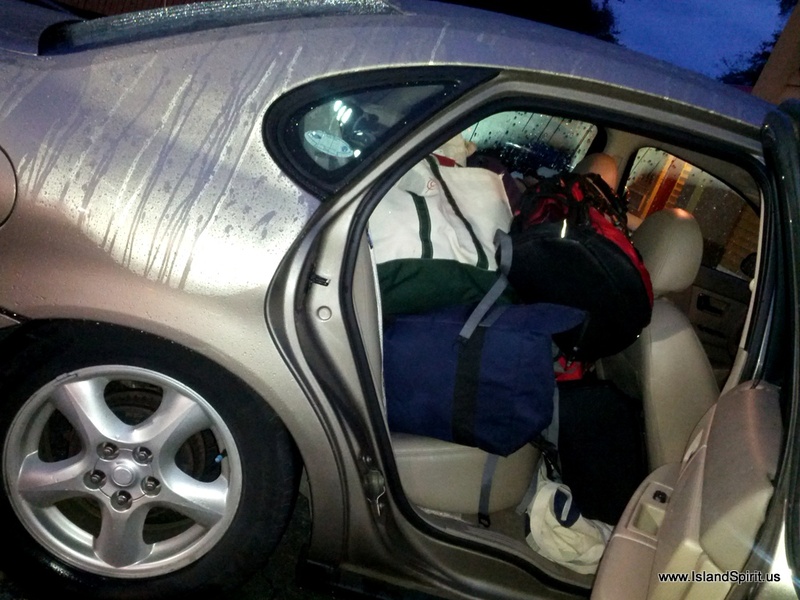 The car was totally overloaded, with the stern nearly down onto the wheels, but GOLDIE still got 27 MPG and ran us to Florida with ZERO glitches. What a car, even with 140,000 miles on her! 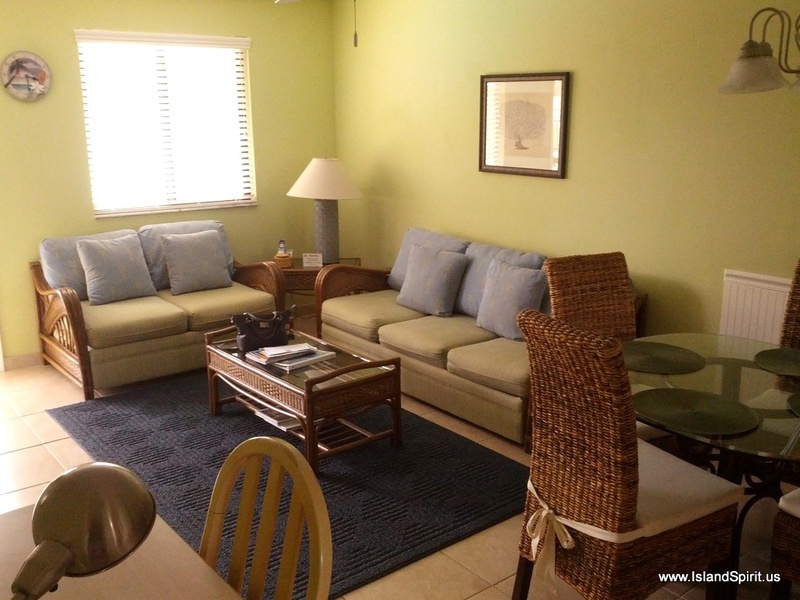 2 Bedroom Condo, Kitchen, Living Room, on the beach! As for accommodations, I have to hand it to Radeen. She really knows how to get the most out of our timeshare ownership. She traded time and booked not one but TWO weeks of timeshare at two different resorts. 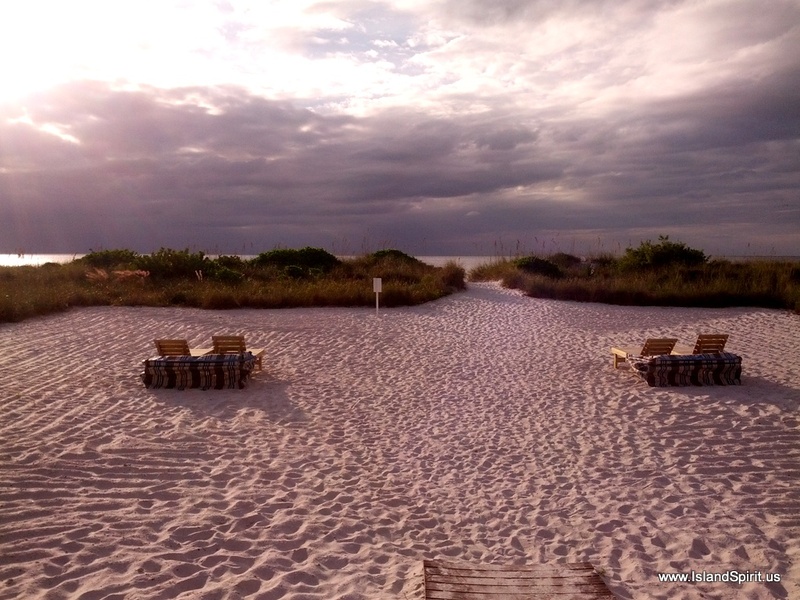 Our first week is ON THE BEACH in a two bedroom condo in Bradenton Beach. 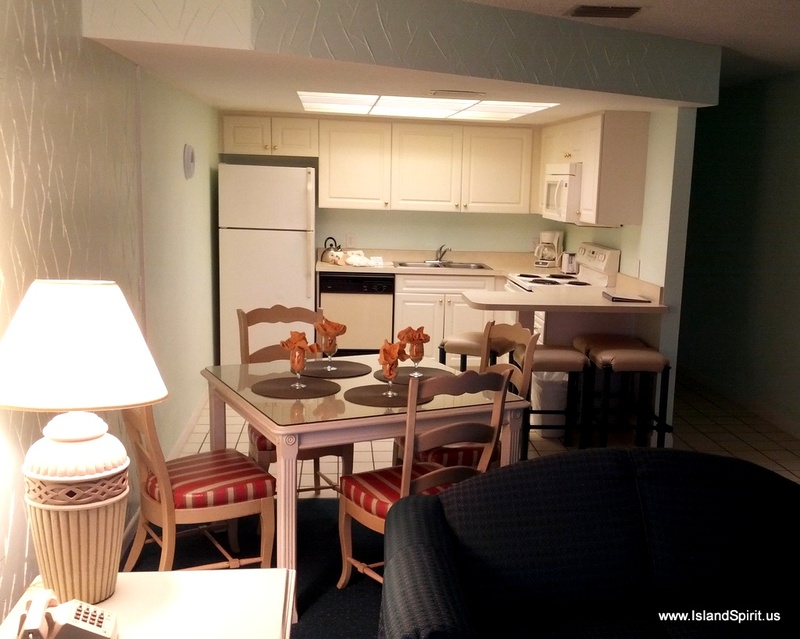 We have a full kitchen, one bath, living room, and two bedrooms. 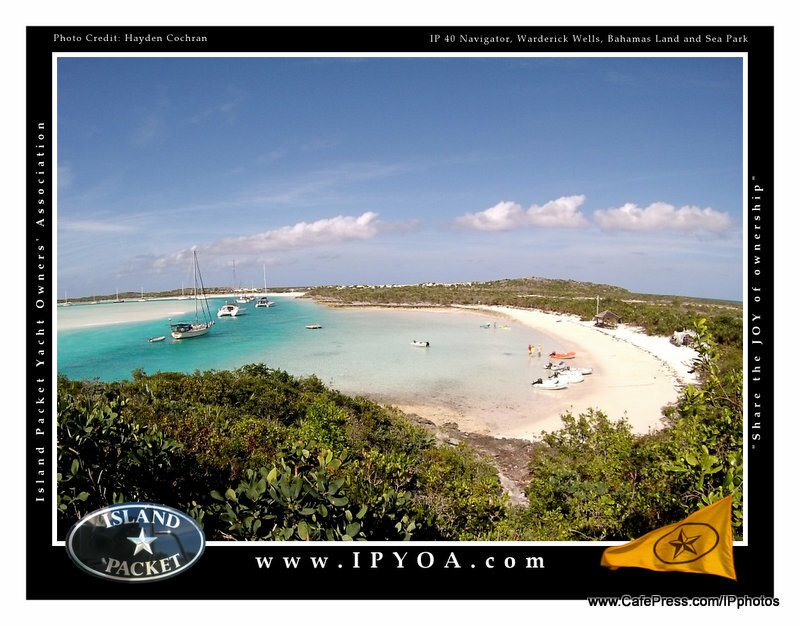 This spot is about 20 minutes from Snead Island Boatworks where we will be working on our boat. Next week, we will move to Siesta Key, where we will be near good friend Captain Blaine. From there, we will be about 30 minutes from Snead. Both of these locations will provide us a place to live while we work on rebuilding our boat. We plan to move back onboard Nov 16 and will stay berthed at Snead until early December. Our first dinner at the condo. So, let the rebuilding begin, the week starts on MONDAY with trucking and splashing. 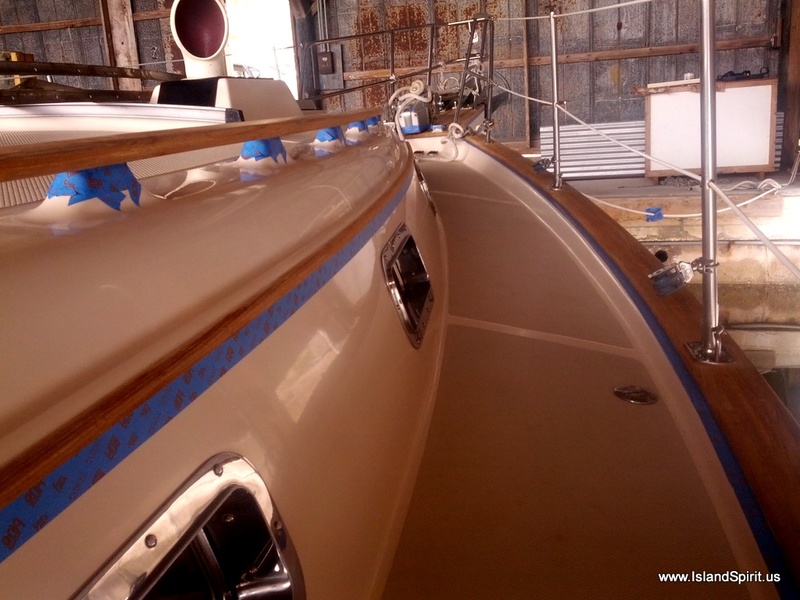 Refinishing the teak and painting the lockers will be followed by working on the mast and installing new rigging.